I bought this button front cotton “house dress” type shirtdress for $4 at Goodwill. I was attracted to the colors in the print but also found the print overwhelming. Cover your eyes- it’s a pink and black zebra. The dress had a rectangle shape and looked frumpy on me. I decided to make a skirt. I made a waistband with the middle piece I cut. 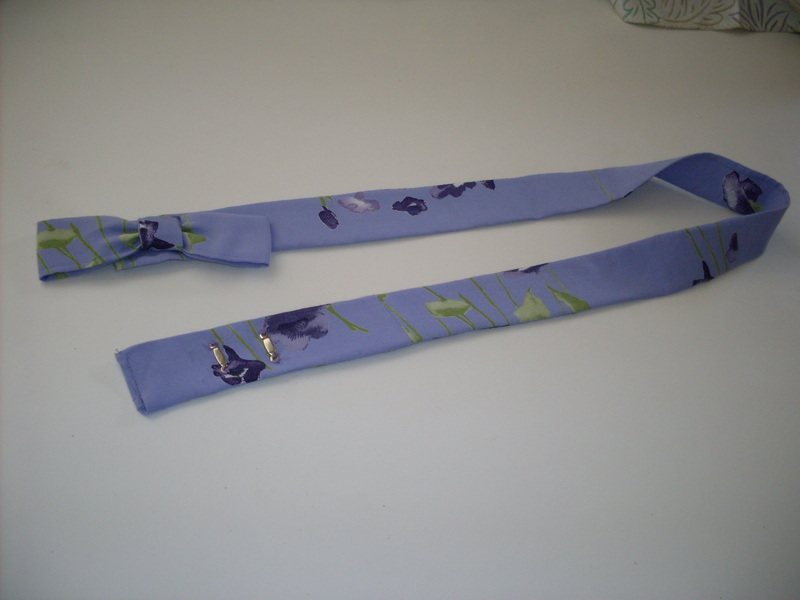 I put elastic in the back waist waistband only, and made a new buttonhole for the front. I also narrowed the waistline by sewing a new seam from the hip to the waist. I practiced my buttonhole on a scrap and it came out perfectly. Then I sewed the real thing and got a big bump. But I stitched it again, and it’ll do. My first buttonhole! I finished this refashion at the end of November before it was cold. All of my dresses and skirts are for warm weather. Next I want to refashion a winter skirt. 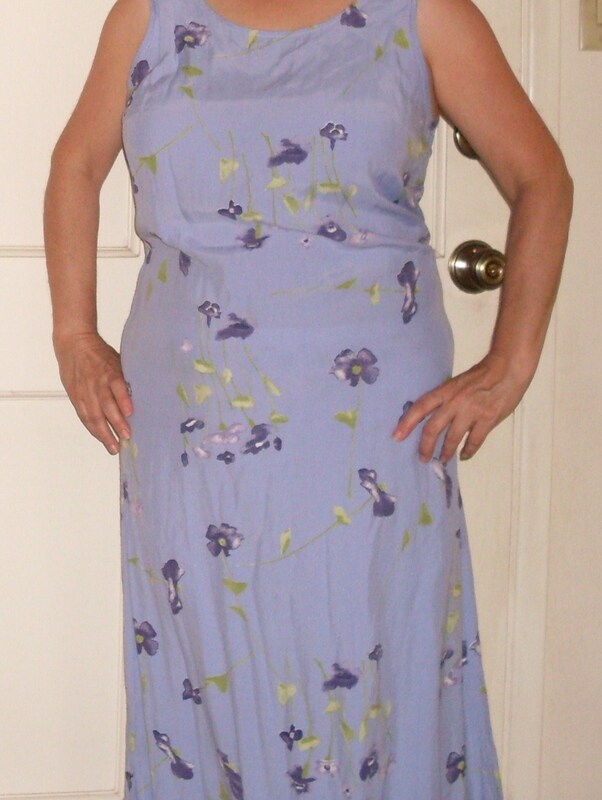 This entry was posted in Refashions and tagged refashion, thrifting on December 30, 2012 by Stitch It Again. I never set foot in a thrift shop until about 2 or 3 years ago. I read about knitters who bought thrift store sweaters, took them apart, and unraveled them to recycle the yarn. So I went in, bought a few sweaters, but only partially unraveled one. Later I went to a new Goodwill that had a dressing room and liked how the clothes were sorted by type and color. And I especially love a bargain! I started going every month and buying some clothes, jewelry, and odds and ends. I also discovered thrifting blogs and then refashioning blogs after I bought my sewing machine. My favorite is The Renegade Seamstress. She takes you through her refashion tutorials step by step, and makes it seem possible that you too can end up with her fantastic results. Could I really make something I’d want to wear out of something that didn’t fit me? I decided to give it a try. I bought this Nina Picolino floor length rayon dress with no closures for $6, which is the going rate for dresses at this Goodwill. Instead of it being too big, like most refashions, this dress was too tight across the hips making it ride up around the waist. I liked the color and print, and thought it would make a pretty ladies tea or garden party type dress. First I cut out the middle and used the middle to make the bow belt from Tilly and the Buttons. 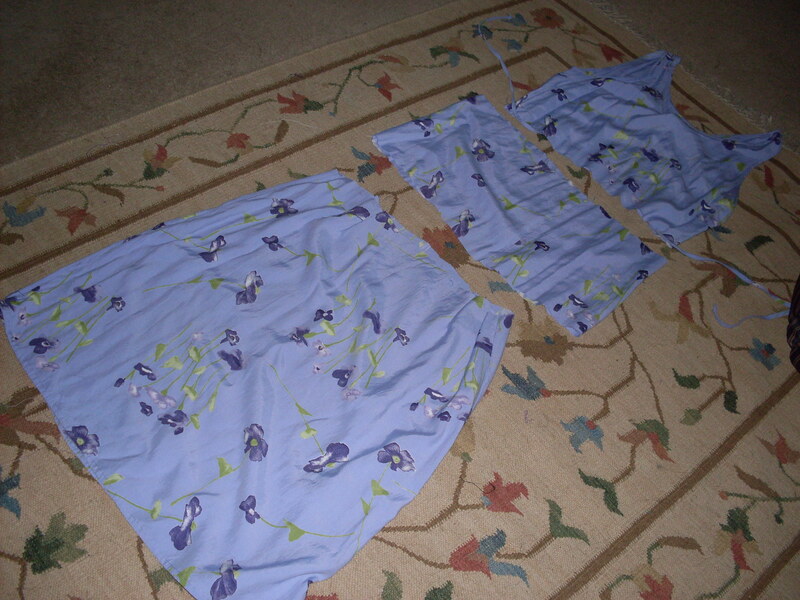 I shortened the shoulder seams to fit, and sewed up the long side slits on the skirt. I made 4 darts on the skirt, 2 smaller darts on the bodice front ( the back already had 2 darts), and then sewed the bodice to skirt, trying to match all 7 seams (the darts, side seams, and back center seam). I say “tried” because I redid the join several times but couldn’t perfectly match all of them, but finally I got close enough. Because there is no zipper, the waist had to be big enough to fit over my bust, which gave me the choice of using elastic at the empire waist seam or leaving it slightly loose and belting for a form fit. 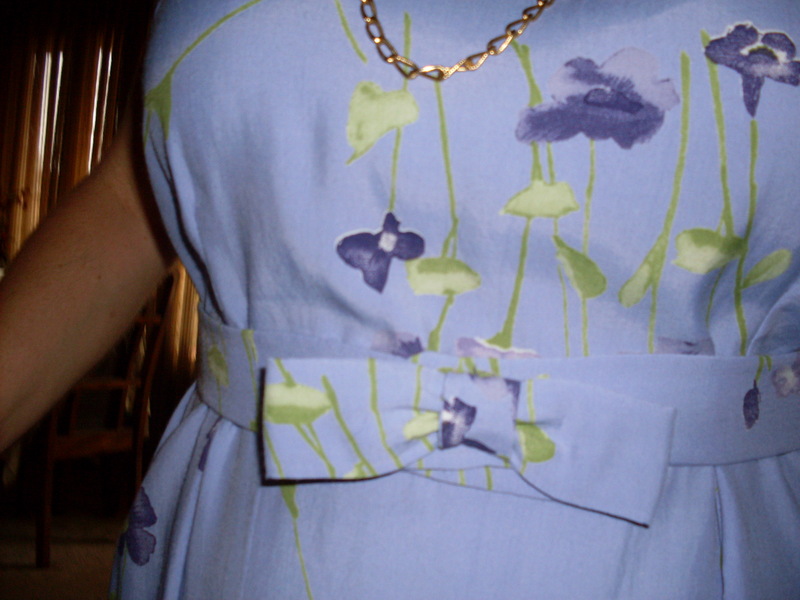 The bow belt was a perfect match for this dress, and I wanted a smooth look for the skirt so I did the latter. I’m going to do this again! 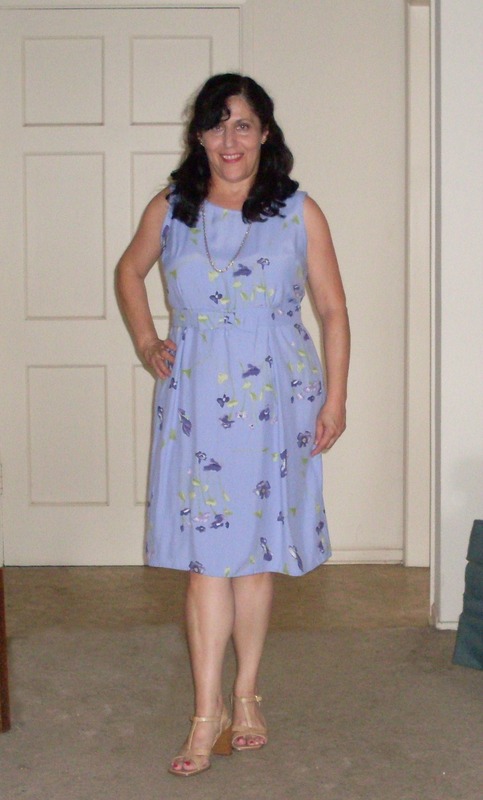 This entry was posted in Refashions and tagged refashion, thrifting on November 10, 2012 by Stitch It Again.